tactile craft, and intentional design. 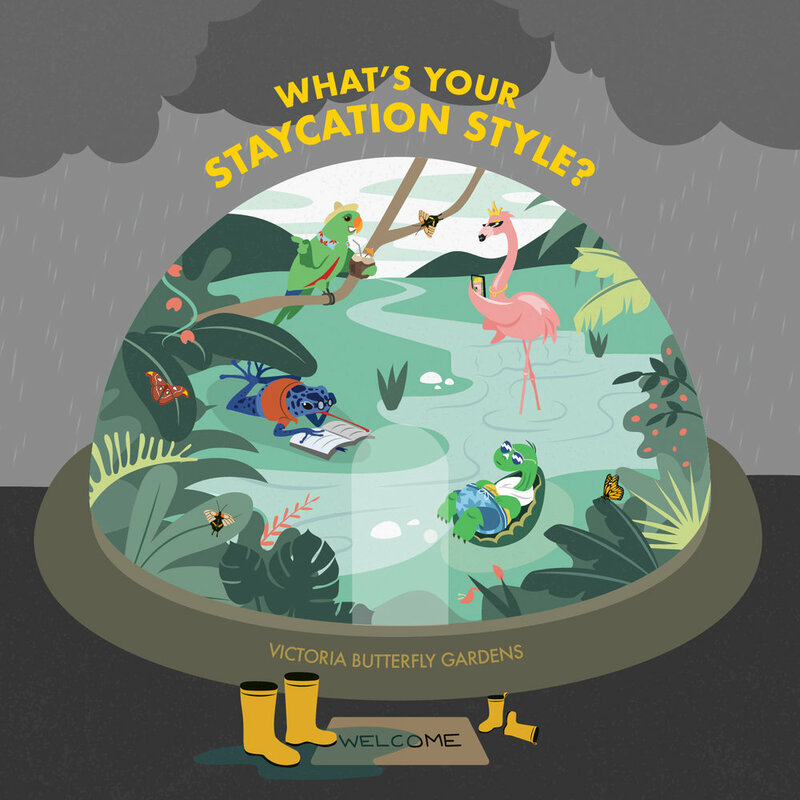 Take a Staycation at the tropical oasis that is the Victoria Butterfly Gardens. To create a modern, trendy, and playful ad campaign to invite young local families to visit the garden during the winter when its dark, cold, and rainy in Victoria. To introduce people to the other animals that live at the gardens other than butterflies. Alicia’s Florals - A locally focused and sustainably-minded floral company. To create a visual identity that represents the modern, stylish, and youthful brand. Alicia provided me with these feelings that the brand should encompass: Wild, Colour, Romantic, Movement. To celebrate the creators hands; the thoughtful and beautiful soul, Alicia Baerg. Curate Developments - A start-up building development company with an impressive portfolio and a contemporary style. To create a visual identity that represents the modern, refined, and capable brand. To stand out amongst other development companies by using attractive colours, fonts, and bold layouts. To create an easily scalable logo to be printed on banners and signage to be installed at building sites. Created at Metropol Industries Inc.
Floyd’s Diner - New branding for an old Victoria classic! To create a new brand identity that reflects their history and 50’s nastalgia. To create a cohesive and memorable brand between their many locations - restaurants and food truck. Create a logo that can be easily transferred to their decor, menus, merch., and signage. Iris Dynamics Ltd. - A robotic engineering company in Victoria, BC. To create a staff appreciation gift that celebrates their company culture of Rick & Morty fans, beer, their shop dog, a mouse, and robotic engineering. After Hothead released a test version of Forged Fantasy they received feedback that their icons appeared blurry. So they wanted new icons made that were simplified and crisp. They called on me to recreate them in vector format (a format game artists don’t use). They still wanted the icons to have the appearance of movement but without the use of gradients or transparencies. This meant relying on line and shape alone. Each character required four icons each representing one of their abilities. They also belong to a faction that required an emblem to represent it. Beyond those, they also needed miscellaneous weapons and action icons. So far we’ve completed over 200 icons. To create large scale posters for the City of Victoria’s pilot project called Commute that will exhibit up to 18 artworks on downtown bus shelters from now until the end of June 2019. To read more about this project you can visit the Commute project page on the City of Victoria’s site by clicking here. Author Clothing Co. - Organic, fair trade, and modern children's clothing company. To create a visual identity for Author Clothing Co. that expresses "process over perfection." To express modernity, simplicity, and intention as well as organic, fair trade, and childlike. To create a consistent visual identity that leaves room for multiple applications and variations. To create a font that looks like a child's cursive writing that will serve as a foundation for the brand. High Noon To Midnight - Awesome local rock n’ roll band! To create a logo that represents their diverse sound and badass stage presence. To create a graphic rich icon that looks good on band merch., posters, and their new album cover. Follow the Buffalo - A creative writing and nomadic lifestyle brand by Sunny Cooper. To create a logo for Follow the Buffalo that represents Sunny's nomadic lifestyle, creative ever-evolving writing practice, and her dedication to her mantra, "Follow The Buffalo." Sunny contacted me to illustrate a logo using ink specifically because of it's organic structure and energetic brush strokes. She wanted to use the blue polaroid of the buffalo as an inspiration. Together we came up with the three colours to represent the three different themes of her creative studio; writing, migration, and her dedication to bringing reconciliation to the First people of America. To create a logo for Medium Art studio that can be placed on many different backgrounds. And that will express the wide range of art mediums that Medium Art Studio offers. To create a logo for Etcetera that will make the viewer aware of it's connection to Medium Art studio, while expressing it's more rustic and farmhouse style home goods. Bravery - Youth mentorship program. To create a visual identity for Bravery that expresses youthfulness, modernity, and minimalism, as well as it's focus on adventure. To standout from other non-profits that often look bright, colourful, and over-sentimental. To create a flexible logo that can be broken down to a bare bones logo or accompanied by sketched icons, a mantra, and a photo background. To create a website that is user-friendly and communicates Bravery's values. To create a case-letter for Bravery that communicates who, what, and how, and that stands out from other text based documents. To create a product for children that promotes education and art, while avoiding the use of quick and easy tactics like bright colours, stock images, and overly-simplified subject matters. To create a game that is fun to play and is beautiful enough to display. To simplify by only use black and white as it is proven to be a factor in infant's eye development. To not assume that young children cannot learn more unique types of animals. To avoid using digital graphics in order to promote the handmade aesthetic. I love the blank canvas that is the poster and have designed many posters over the years for local events in Victoria, BC. I strive to create posters that are eye-catching by using complimentary colours, stylish fonts, and striking layouts. My ongoing goal is to promote a handmade aesthetic though hand or digital illustration. The Cinevic & Gelati posters were created at Metropol Industries Inc. Brand Identity & Logo Design - A few of my favourites. A number of these logos were created at Metropol Industries Inc.